Betsy: But I don't know about zombies, Doctor. Just what is a zombie? Dr. Maxwell: A ghost, a living dead. It's also a drink. Betsy: Yes, I tried one once, but there wasn't anything dead about it. 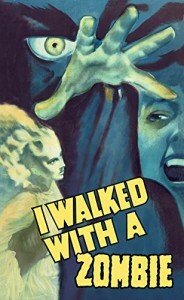 I Walked with a Zombie is a short film with many charms. It's director Jacques Tourneur and producer Val Lewton's follow-up to Cat People, made the previous year. It may be the best zombie movie ever made. Of course, we're talking old school zombies here. The story takes place on a small Caribbean island, where the descendants of African slaves practice voodoo. It is told by Betsy, the nurse who comes to the island to care for plantation-owner Paul Holland's ailing wife, Jessica. Jessica, we discover, lives in a semi-comatose state: though she can walk and follow simple directions, she has no will of her own. The story, written by Curt Siodmak (Donovan's Brain) and Ardel Wray, is one of surprising depth. There's the double-backstory, for instance -- of the island's history and the history of Paul and his family -- the atmosphere, and the detail of the voodoo rituals. Layered one atop the other, what emerges is a portrait of a family torn apart by dark forces and passions. Relatively early in the film, Betsy and Paul's brother sit down for a drink at a local bar. Their conversation is interrupted by a calypso singer, telling the story of the Holland family. The words provide backstory, the style a Caribbean atmosphere, and the title, "Shame and Sorrow," the theme of the entire picture. A short film this may be, but it packs a lot into 69 minutes. One of its charms, though, is that it is, like Cat People, an ambiguous tale, one in which the supernatural and the psychological vie for supremacy. It provides no easy answers. And isn't that ultimately more terrifying than a bunch of bumbling brain-eaters?